The recent post noted the underperformance of high yield corporate bonds relative to high quality bonds over the last few months. In general, a preference for riskier, high yield fixed income has suggested a general risk appetite among investors, whereas periods of underperformance have been associated with a broader risk aversion. The chart above extends the look at the relationship between high yield (JNK) and high quality (LQD) bonds back to the beginning of 2008. What you can see is that relative interest in high yield returned early in 2009 and fell off significantly during the summer 2011 risk-off period. 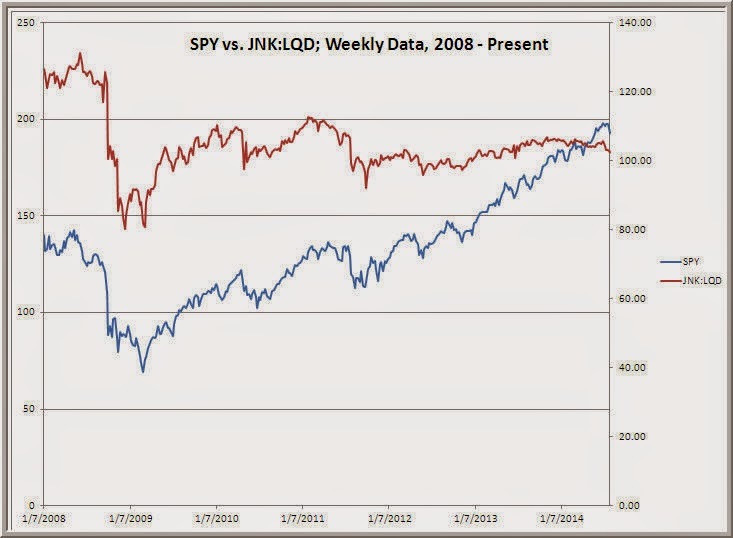 Notice, however, that as stocks (SPY) have since moved steadily to new highs, the relative relationship between JNK and LQD has remained below that 2011 peak. Moreover, the volatility of the JNK:LQD relationship has declined significantly during the same period that stock volatility has been crushed. Since five-week realized volatility in JNK bottomed early in June of this year, we've seen a notable uptick in high-yield volatility. Not surprisingly, that has been accompanied by a selloff in stocks. Given the underperformance of high-yield bonds generally and now their uptick in volatility, I will be watching the sector closely for signs of risk aversion that could affect markets more broadly.